Our Citroen HVan, or Josephine as we have named her, came off the production line in 1978, although the original design dates back to just after the Second World War. These iconic French market trader vehicles were made until 1981, the majority in France but some, like ours, in Holland and there were many variations including horse carriers, long wheelbase, and flatbeds. Our van arrived from Britany on the back of a trailer in 2010 and we then had her done up to our specification in a local engineering workshop, having sourced all the crêpe equipment from France. The technically minded might want to know that the van is powered by a 1911 cc water-cooled petrol engine through a 3-speed gearbox. On a downhill slope with the wind behind her, she will rattle along at 60 mph but fuel economy is a miserly 20 mpg! Everyone loved Le Café Crème and your delicious crêpes! We are both so glad we decided to have you at our evening wedding party. Thank you so much! Thank you so much being part of our wedding day. Your crêpes and van made our day so special and we cannot thank you enough. Everybody commented on how cute and well decorated the van was and how tasty the crêpes were. I believe some people came up for seconds and thirds! 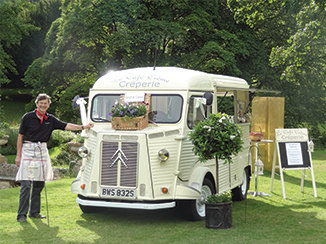 Thank you so much for bringing Le Café Crème to serve your yummy crêpes at our wedding disco party. Your adorable van fitted in perfectly with our retro-themed wedding and everyone has commented on what an original idea it was. I think you may get more bookings from some of our guests who are planning their own weddings! A massive, but very late, thank you for being at our wedding. The crêpes were amazing – people still talk about them. The van looked amazing, I couldn’t have asked for better.